Have you ever reached the end of a day and felt like you got nothing done? Inefficiency can be very costly, especially for those in social media and digital marketing. This area of work never has any downtime, and it can be exhausting. If you could do those inefficient days over again, chances are you would handle your meetings, conversations, and even your private work time a little differently. But many people look at their to-do list and get so overwhelmed that they end up doing nothing. 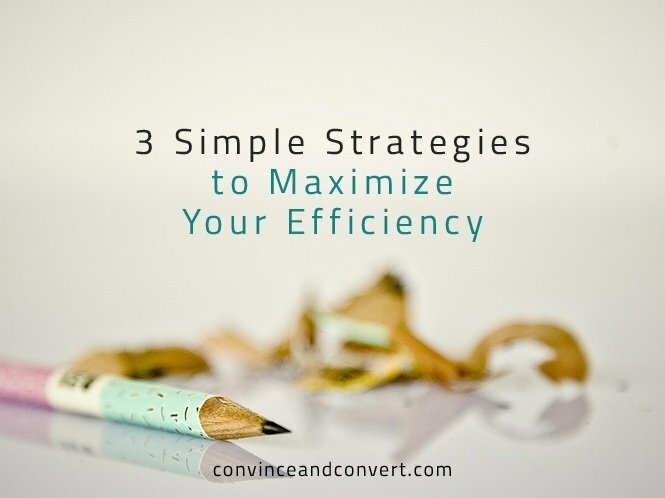 Fortunately, a few simple strategies can help you change all that and increase your efficiency like never before. What if, at the end of every day, you accomplished five or more specific tasks that brought you one step closer to your most important goal? It wouldn’t take very many days in a row to start seeing tangible and lasting results. The DMA strategy gives powerful clarity. DMA stands for Difference-Making Actions. DMAs simply give you the focus and intentionality to do the most important things every day. This simple strategy will increase results like nothing else. Make a habit of doing DMAs on a daily basis, and your impact will multiply. First thing every morning, take a sticky note. At the top, write your most important current goal. Then write the numbers 1–5 down the page. Next to the 1, write the most important thing you could do today to accomplish that goal. Then write the next most important thing under 2, and so on. You now have a list of the 5 most important things you could to today that would make the biggest difference in accomplishing your goal and ultimately fulfilling your organization’s mission. F = First priority first. List your tasks in order of priority, and then do them in order. Don’t start working on the second task until you have finished the first one or you have come to a roadblock that requires someone else’s help. In addition, remember that your DMAs are the most important actions for the day. Don’t attempt more than five, or you might get overwhelmed and do nothing. If you can’t boil them down to a few simply stated tasks, then you probably need to restate your goal. U = Under the main vision and current major objective. DMAs are the five most important actions you can take today to move your organization forward. They must come under your main vision and help accomplish your most important and current priorities! N = Number attached. It is not a DMA unless there is a specific number attached. In other words, “Calling more prospects” is not a DMA, but “Making 10 sales calls” is. “Organizing your office” is not a DMA, but “Organizing for 20 minutes” or “Cleaning out 2 drawers” are DMAs. Difference-Making Actions must be quantifiable. It is important to note that DMAs are based solely on what you can do, not what others need to do. In other words, “Calling three people” is a DMA as that does not rely on whether anyone answers or not. However, “Selling 5 gadgets” is not a DMA, as it relies on what others must do. If you consistently do your DMAs, great outcomes will follow. Each time you complete a Difference-Making Action, put a line through it. Believe it or not, there is great satisfaction in seeing that sticky note at the end of the day with five lines crossed through your most important tasks. I once had an intern fresh out of college who was invaluable to our organization. Every day, he accomplished his DMAs and then left that sticky note on his cubicle wall. Each day he added his next sticky note with lines through his accomplishments. Do you think he needed to be micromanaged? No way! There was proof on the wall he was doing Difference-Making Actions that moved our mission forward every single day. Be focused. When you write your DMAs, make sure that they are focused. Your DMAs are the most important actions for the day—you shouldn’t have any more than three. If you can’t boil them down to a few simply-stated tasks, then you probably need to restate your goal. Be realistic. Your DMAs will not be effective if you can’t actually do them. Don’t write down that you would like to write five proposals every day, if you know realistically you can’t finish more than two. Be committed. Build your day around your DMAs. Now that you have them, make sure you prioritize them over all other things, meetings, emails, and less important tasks. I often have my DMAs done by 11 a.m. because I do them first. The rest of my day can be structured as needed, but I first did something important that will make a significant impact on my organization and the lives of those we serve. Most companies do strategic planning at an off-site location, yet this strategy provides little momentum toward action. Instead of long planning sessions, try making a 90-Day Quick Plan. Ninety days is perfect. It isn’t twenty-one days, and it isn’t a year. It’s long enough to accomplish a goal, yet not lose sight of it. The 90-Day Quick Plan gives leaders and teams an actionable framework that provides clarity and leads to tangible results both personally and professionally. Here’s how to make it work. Pick an area of your business or life that you’d like to address, and then ask six questions. Remember: The plan should take less than 30 minutes to create. Question 1: Where am I? If you do not know where you are today, you cannot know where you would like to be in the future. (If you are doing a 90-Day Quick Plan as a team, ask, “Where are we?” and use “we” in the following questions as well.) Ask this question, and you will be able to quickly identify strengths, weaknesses, opportunities, and threats. For example, where am I in my relationship with my kids? Where am I in my health? Where am I in comparison to expected sales? Where are we as far as the number of people we are reaching with our message or product? Question 2: Where am I going in 90 days? Remember, it is not one year or five years like many strategic plans. Thinking about your answer in question 1, where would you like to be in 90 days? Write a clear, quantifiable (numerical if possible) goal. You will likely accomplish more than you thought in just 90 days! Question 3: Why am I going? If the “why” is strong enough, the plan does not need to be perfect. If a building is burning and my kids are in it, I don’t need to know every detail—I’m going in because my “why” is so strong. When your team is motivated and unified, they’ll do the little things differently. They’ll stay passionate and focused, and they’ll finish. Question 4: How are we going to get there? How? Keep asking “how” until your team commits to taking specific actions. Question 5: How are we going to get there? I press people to ask, “How?” until they have come up with a specific action they will take starting today or tomorrow at the latest. Question 6: How are we going to get there? I have found people must ask, “How?” at least three times before they are clear enough. It may take asking, “How?” seven times in order to get enough clarity. Don’t stop asking “how” until you or your team has decided on a specific action that will be taken starting today or tomorrow. Writing down your DMAs is one thing, but getting them done is another. Despite our best intentions, we all know how quickly those priorities can be set aside in order to deal with the most urgent tasks. A “power hour” can be a great way to keep at what is most important. It’s so simple, you might be surprised at how well it works. So what is the secret? One quiet hour every day. For 60 minutes each morning, don’t do meetings, phone calls, or e-mails. Don’t take any interruptions. Messages go to voice mail, and the inbox fills. Unlike many offices, you will really be able to focus, concentrate, and serve others best by actually getting something done for them. Go public. Let everyone you work with know you are setting aside an hour a day. Informing assistants, customers, and colleagues of your plans will leave them less likely to disturb you. Share the idea. In my office, everyone gets a quiet hour. That way, we don’t interrupt each other, and we all get more done. Be consistent. Use the same time every day for your quiet hour if you can. It will allow people who work with you to get used to your routine and help reinforce the habit in your mind. Try these methods for a while. You will be surprised at how much you can accomplish in just one hour or with an itemized list of DMAs. Not only will you make headway on your biggest projects, but you will find that by getting the day off to a strong start, you might feel energized to accomplish more in your remaining time. David Horsager, author of national bestseller The Trust Edge, speaks to business leaders across the nation while continuing to research and write on the bottom-line impact of trust and productivity. His second book, The Daily Edge: Simple Strategies to Increase Efficiency and Make an Impact Every Day, was just released this week.